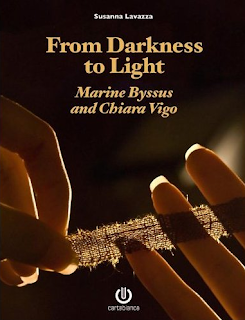 Marine Byssus and Chiara Vigo - ebook! 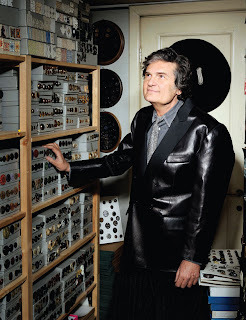 If you visit the Needleprint blog to read today's post, you will find it is about Franco Jacassi, who has over 10 million buttons in his vintage clothing showroom in Milan and about 70,000 buttons in his own private collection. Make sure to watch the video at the end of the post! If you do a Google search of his name, Franco Jacassi turns up in many articles and on many blogs in several different languages. Over 30 years of collecting and exhibiting have made him indispensible to all the high fashion houses around the world, to vintage collectors and especially to those who love buttons! The showroom houses many other vintage items besides buttons. Clothing, laces, ribbons, zippers, hats, handbags, old fashion magazines - something for everyone! The latest craze for all things vintage has inspired Franco Jacassi to develop a line of accessories. There is an excellent interview (in English) with Franco Jacassi here. No. 3 Via Giuseppe Sacchi in Milan. It is open from 10 am to 1 pm and then from 2 pm to 7pm, Monday to Friday. Closed the month of August. On the 16th of June at the Biografilm Festival in Bologna, Chiara Vigo herself will be on hand at the presentation of Susanna Lavazza's ebook written about Signora Vigo and what she does with the Byssus or Sea Silk fibres that she collects from the Pinna Nobilis in Sardinia. The Italian version can be downloaded from a list provided on Chiara Vigo's blog here. On YouTube you can watch the 40 minute presentation of the book (in Italian and Sardinian). At about the 31 minute mark, there is a Swiss film (dubbed in Italian) which has some great photography of the Pinna Noblis in it's natural habitat. For more information (in Italian) go to Chiara Vigo's blog. Thanks to Rossella for the heads up!! This is just a quick note because I cannot find the time to contact everyone. I will not be able to attend the EAC National Seminar in Victoria this year. I cannot get the time off work. I'm very sorry not to be able to meet the people I wanted to and to see old friends again. Hopefully life will provide us with another opportunity in the near future. Excuse the off-topic post, but this was the quickest way to do this!